AE 1's are larger than a US half dollar coin: 28 mm and larger. Antoninianus -- the modern name for a coin whose actual name is lost to us, introduced in 215 C.E. and phased out in 294. On this type of coin, the emperor is always shown with a radiate crown (empresses are shown on a crescent). The Antoninianus replaced the highly debased denarius as the standard coin of the Empire for a time and was valued as a double-denarius. 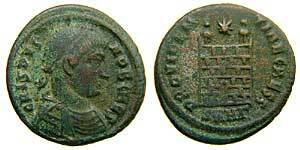 Although coins with radiate crowns minted after 294 are often called "Antoniniani," technically these are "post-reform radiates." augustus -- "revered one." This title, after it was assumed by Octavianus Caesar, became the identifying mark of the Roman emperors. It often appears abbreviated as AVG at the end of the obverse inscriptions found on ACE coins. barbarous imitations -- coins minted on the outer edges of the Empire that copy, with more or less exactness, official coinage. These pieces have not received the exhaustive study devoted to official Roman issues and consequently are poorly understood in terms of the role they played in local economies. billion - not to be confused with "billon." One thousand million, or 1 followed by 9 zeros. billon -- any silver alloy containing less than 50% silver, and often much less. Many of the 3rd-century coins that we call "silver" are actually billon. bullion - not to be confused with "billon." Precious metal, such as silver or gold, valued solely as precious metal. bronze -- an alloy of copper with tin. Roman bronze may also contain significant amounts of other metals such as lead, silver and iron. Caesar -- someone who has officially been named as heir to the emperor. The titles and sometimes the headgear of Caesars are different from those of emperors, so this is potentially an important clue in identifying a coin. For more information, see the FAQ. campgate -- a structure shown on some Roman coins. It is made of rows of bricks or stones, has domed structures at the top, and usually has a door or entrance in the middle. There's an ongoing controversy about whether this actually represents the entrance gate to a camp (castra), one of the "Mile Houses" along a defensive wall, or a tower topped with signal beacons. In any case, the reverse type is usually referred to by this name. when a coin is similar but not identical to a coin listed in one of the standard catalogues. cornucopia -- the "horn of plenty," a symbol of abundance, sometimes held by a figure on the reverse of a coin. Note that coin descriptions sometimes refer to one cornucopia as cornucopiae. The Latin genitive -ae ending is used to express "of plenty." cuirass -- a soldier's armored breastplate, usually including shoulder protection which may be all that is visible under drapery if a bust is "draped and cuirassed." denominations - Although the vast majority of coins you are likely to encounter in the ACE program have had their denomination-names forgotten by history (See "AE") , it might be useful to list the familiar and well-known denominations of the early Empire. The "denomination of account" was the Sestertius. Gold Quinarius - one-half Aureus. Silver Denarius - silver coin about the size of a US dime or a little larger, worth 16 copper Asses or 4 Sestertii. Orichalcum (brass) Semis - One-half As. Copper Quadrans - one-quarter As. Other, later denominations for which we know the names included the Follis, an originally large, but rapidly shrinking silvered AE coin introduced by Diocletian, and the Centenionalis, a medium-sized, silvered AE coin introduced about a decade after the death of Constantine the Great. The Argenteus and Siliqua were silver denominations during the later empire, and the Solidus replaced the Aureus as the main gold coin during the reign of Constantine. There are also diadems that combine rosettes and pearls, as well as diadems that incorporate laurel leaves or wreaths. die -- a piece of hardened metal engraved with the mirror image of a coin's design. Ancient coins were hand-struck by using a hammer to mash the flan between a pair of dies. This had the effect of impressing the designs on the obverse and reverse of the coin. found here, on the reverse. Sometimes the exergue contains other elements, such as stars, pellets, Roman numerals, or Greek letters. fourree -- a coin made by wrapping a thin foil of precious metal around a core of base metal before striking. This was done to give the illusion that the coin was made of solid gold or silver. Fourrees were counterfeits made to deceive, and should not be confused with officially issued, silvered AE coins. imperator -- supreme military commander. This designation goes back well before the imperial period of Roman history, but it came to be one of the emperor's titles and sometimes appears (abbreviated as IMP) at the beginning of the obverse inscription on ACE coins. labarum -- a Roman military standard bearing a Christian symbol. ACE coins from the Christian late Empire sometimes depict a labarum displaying the Chi-Rho symbol, or Christogram, made up of the first two Greek letters of the name of Christ. Note that although the symbol itself is sometimes called a "labarum," the labarum was actually the standard on which it was displayed. left and right -- somewhat confusing terms, when applied to coin design! If the figure on a coin is described as standing, seated, or looking left, this means that the figure's body or head is turned to the left of the coin as you are looking at it. The figure itself, however, might be on the right side of the coin. An example would be: "Emperor standing right, receiving Victory on globe from Jupiter standing left." This is shorthand for: "On the left, the Emperor is standing facing to the right, receiving a globe from Jupiter, who is standing on the right, facing to the left." patina -- a natural surface coating on an ancient coin created by the interaction of the coin with its environment. The patina, which may be one of a wide range of colors, is often one of the main components of a coin's beauty and character. It is also a natural, non-reactive "capsule" protecting the coin from further damage. personification -- a human-looking figure used to symbolize or embody something intangible such as justice, peace, or liberty. The Statue of Liberty and the Liberty heads or the standing or walking representations of Liberty on earlier coins of the US are familiar examples of an allegorical personification. phoenix -- As no Harry Potter fan needs to be told, the phoenix was a mythic bird that was said to be consumed by fire in its old age and then reborn, young and strong. It sometimes appears on ACE coins in association with the motto, "the restoration of happy times." Roman imperial coin issues and variants, each of which is assigned a number. RIC references usually include the volume number, the coin number, and sometimes, a letter designating a particular variant of the coin. Since the numbering sequences in the several RIC volumes that cover "our" period all start over again with each mint in each time period, you must be sure that your coin is exactly the same as one described or pictured, down to the tiniest detail, before you identify it with an RIC number -- say, from a similar coin you've seen on wildwinds. If your coin is similar but not identical, you can use the term "cf." If you can describe your coin precisely and completely, one of the numismatists who answer student questions on the ACEhelp list may be able to supply you with an accurate RIC number. scepter -- a staff carried as a sign of authority. On Roman coins, the scepter is often shown full-length, that is, taller than a standing person. Sear -- David Sear, among others, has written an extremely important series of handbooks for various fields of ancient coins. His Roman Coins and Their Values has been published in several editions over the years and is in the process of being updated for the new millennium. silvered -- covered with a thin wash of silver to disguise the fact that the coin has little or no silver content and to indicate that it belongs to the silver series of denominations. This is not unlike the silver-clad US 50 cent pieces of the 1960's and 70's. one of the standard coin catalogues often referred to in coin attributions.